Innovative Fruit Label Cleans Produce and Dissolves Away: Get a Stake in it Now! Heard of a business plan lately that combines form + function + business sense? Scott Amron, a celebrated artist and engineer has done just that! 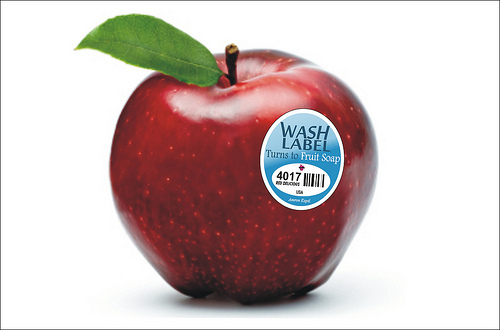 With a reputation for creating innovative and clever products, Scott has devised a simple but innovative FruitWash label that dissolves into soap and helps clean the produce its on! The artist and engineer, who made a splash a few years back with his simple yet revolutionary design for a toothbrush that can redirect water, is at it again with perhaps his most elegant idea yet: fruit stickers that dissolve into soap. Fruit labels are stubborn and hard to remove. Sometimes I have to just cut off a part of the fruit to avoid the nasty glue that it leaves behind. But Scott’s FruitWash labels dissolve into an organic fruit cleansing produce wash that helps remove wax, pesticides, dirt and bacteria. The sticker can come off normally but imagine the waste you are avoiding with those millions of little pieces of irksome labels floating around, sometimes in your sink and sometimes in the trash. (Just remember to wash your produce in a sink filled with water, rather than let the faucet run while washing for maximum effect and water savings). The stickers have not hit the market yet but you can invest in the business model through a 10% stake in the venture. Now that is an Eco-entrepreneur!